Valid from 1 June - 31 July 2017 Porsche Design Eyewear: $50 Robinsons Voucher & join Grand Lucky Draw! It is getting to the hottest period of the year in Singapore. What's the best way to protect your eyes against the glaring sun and make a fashion statement at the same time? Get a pair of Porsche Design Eyewear sunglasses! 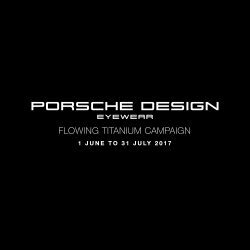 You can now purchase Porsche Design Eyewear and receive Al-Futtaim Retail Asia (formerly Robinsons) $50 Voucher from 1 June - 31 July 2017! The first 100 customers* who purchase a Porsche Design Eyewear from participating optical stores will receive an Al-Futtaim Retail Asia (formerly Robinsons) $50 Voucher! You can also win attractive Porsche Design Premiums at the Grand Lucky Draw! Get a new pair of sunglasses or prescription glasses now! 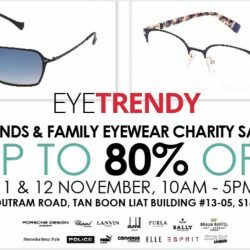 Enjoy up to 80% off luxury eyewear brands like Porsche Design, Lanvin, Dunhill, Furla and more during Eye Trendy Friends & Family Eyewear Charity Sales on the 11th and 12th November @ Tan Boon Liat Building! See you there!